Cross-border small-scale traders, who command a sizeable share in the economic drive in this region, are in for a big boost after an international call for the formalization and recognition of the trade, mostly carried out manually by women, the youth and the disabled. A two-day workshop-taking place in Lemigo Hotel is discussing the formalization and recognition of informal cross-border trade and the importance of the role that it plays in the regional integration as well as to national economies. During the regional workshop organised by the Food and Agriculture Organization of the United Nations (FAO) in partnership with CUTS International, participants have officially launched an ICBT (Informal Cross-border Trade) study conducted in various African countries and shared the good practices and recommendations that can be applied in the other African countries. The study focuses on women and youth, who make up the majority of the informal cross-border trade yet, according to different presentations and discussions; policymakers often ignore them. Among the major problems that these women face, according to the studies, are low start-up capital and limited access to finance. The little or lack of attention by policy makers to the ICBT actors reflects, in part, the limited amount of information about their activities as well as inappropriate knowledge of the profile of the actors. FAO Country Representative, Attaher Maiga, told journalists on the sidelines of the workshop that the initiative to call the attention of policymakers in different countries to formalise this trade is premised on the importance of informal cross-border trade to regional integration and national economies and at the same time, recognizing the role that women play in this regard. Maiga argues that once this role is recognized, policymakers will make decisions aimed at improving the way cross-border trade is perceived. Maiga also observes that without proper data collection, informed policies are not possible. “You cannot make better policy decisions if you don’t have reliable data. Data collection is quite critical in order to know the magnitude of those who practice cross-border trade,” He argues. While estimates show that women dominate this trade, Maiga said the data do not specify the magnitude of women who are in this trade, which renders it difficult for policymakers to make decisions that can improve their business. “Cross-border trade contributes approximately 42% to the Gross National Product. But that is a global estimation for Africa. In respective countries, figures are not disaggregated to know what women do in this trade,” Maiga says, and recommends that the countries should report the data properly so that the role of women is better recognized. He says that Rwanda, like many other countries has very good practices that can be emulated by other countries. 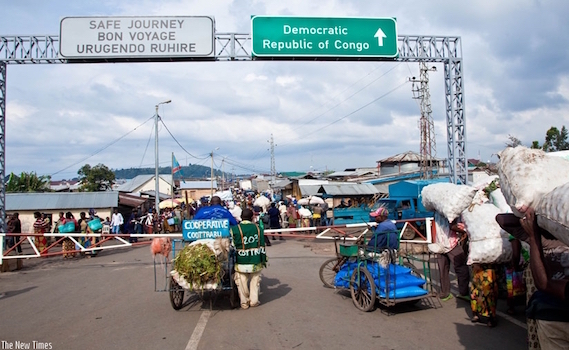 Informal cross-border trade constitutes a major part of economic activity in most African countries. In the southern African Development Community (SADC), for example, the type of trade makes up an estimated 30-40 percent of total intra-SADC trade, with an estimated value of $ 17.6bn. Typically, women represent up to 70% of ICBT on the continent, trading in a variety of commodities either in raw or semi-processed, including basic to luxury goods produced in other countries. In Africa, it is generally accepted that constraints on women, such as limited access to finance, traditional values, gender roles, violence and even health issues, have in the past hindered them from seizing the opportunities provided by the expansion of trade, and in particular the move from informal to formal trade regimes.